Your kidneys are in charge of filtering wastes out of your blood. But, if your kidneys don't work as well as they should, you may need a procedure called dialysis, a process that removes wastes in place of your kidneys. Let's talk about dialysis. Your kidneys have several important jobs. In addition to filtering your blood, they help maintain just the right balance of water, acids, and minerals in your body. The also function as part of the endocrine system producing hormones. If you've had kidney disease for many years, or your kidneys have suddenly failed because of disease or injury, your doctor may recommend that you have dialysis, a treatment that replaces some of what the kidneys do, removing waste and excess fluid from your blood. It is sometimes used as a holding treatment while awaiting a kidney transplant. Here's how dialysis works. First, your doctor will need to create an access to reach your blood vessels. 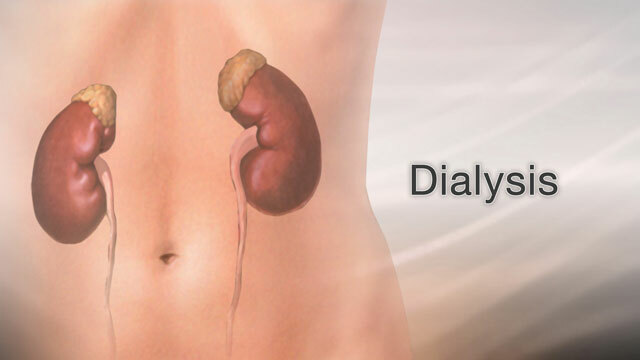 If you need dialysis only for a short period of time, that access will be made using a hollow tube, called a catheter. Usually the catheter is placed into a large vein in your neck, chest, or leg near your groin. If you're having dialysis for a longer period of time, you'll need a more permanent access. To create this access, your doctor will connect one of your arteries to one of your veins. Then whenever you have dialysis, a needle is simply placed into this access area. During each dialysis session, your blood is removed from your body through the needle. It's sent across a special filter, which removes harmful substances from your blood. Then, your clean blood is sent back into your body. Often, you'll visit a special center for dialysis about three times a week. Each session lasts three to four hours. Or, you may be able to do dialysis right at home three times a week or even daily. Home sessions are shorter, about 2 to 3 hours, and they're easier for your body to tolerate. Before you perform dialysis at home, a nurse will teach you how to place the needle, how to clean the machine, and monitor your blood pressure during treatment. It's important when you're having dialysis that you do all of your scheduled sessions. Also, call your doctor right away if you have any problems, like swelling, redness, fever, a drop in blood pressure, or bleeding. These could be signs that you've developed an infection or other complication from your dialysis, and need medical attention.